Take one teenage Welsh girl from the Swansea Valley, add a Beatle benefactor and the emergence of the Apple label and you have the sylph-like talent of Mary Hopkin whose debut single “Those Were the Days” was released in August 1968 and would become the sound of the summer with four European language versions – all produced by Paul McCartney. Mary’s stint with Apple resulted in two albums, Post Card and Earth Song/Ocean Song, a slew of well-crafted singles and an EP released in Indonesia. In the meantime she continued to record in her native Welsh language on side projects and was chosen to sing the United Kingdom’s entry for the 1970 Eurovision Song Contest with the catchy “Knock, Who’s There?” Given her disposition and wholesome image it was no surprise that Hopkin became a TV star and a celebrity in the late 1960s and early 1970s. The patronage of The Beatles ended as they themselves did but she then worked with her future husband Tony Visconti and also made a comeback after starting a family. During that period Mary made guest appearances as Mary Visconti on albums produced by, or otherwise involving, her husband: these include Tom Paxton’s Peace Will Come, Bert Jansch’s Moonshine and David Bowie’s Low (she features on the track “Sound and Vision”). Later alliances found Mary on work by Hazel O’Connor and Elaine Paige as well as Tony’s extraordinary and now super obscure album Visconti’s Directory. Stage and TV acting gave her a new outlet but she has always been in demand for her lucid vocals, especially when teamed with The Chieftains, Peter Skellern and Julian Lloyd Webber’s 1980s project, Oasis, and Welsh related folk music. A long lasting friendship with Beatles producer George Martin led to her casting in his production of Under Milk Wood. It’s been an intriguing life. Who knew that she sang the eerie intonation on “Rachel’s Song” from the Vangelis soundtrack to Blade Runner? The Beatles, Bowie and Blade Runner? That is more than cool but there is much more besides. Born in Pontardawe, Wales in 1950 Mary Hopkin joined the folk troupe the Selby Set and Mary while still a schoolgirl. Her talents won her local fame and she recorded an EP of Welsh language songs for the independent Cambrian (these have since been reissued). Her major break came about when she appeared on the ITV talent show, Opportunity Knocks, the Britain’s Got Talent of its era. The supermodel Twiggy happened to catch her performance and phoned Paul McCartney to share the good news – this young woman was a potential star. McCartney concurred and after auditioning Mary in the Apple offices he signed her to The Beatles’ Apple record label, thus making her the third artist to record under the distinctive logo: The Beatles own “Hey Jude”/”Revolution” was the first; a privately pressed but not officially issued recording by Frank Sinatra of “The Lady Is a Champ – But Beautiful” was second and her signature piece “Those Were the Days” b/w “Turn! Turn! Turn!” soon followed. A recreation of a Russian folk song, “Those Were the Days” benefitted from a distinctive eastern European rhythm and an obvious sing-along appeal that justified a lengthy five minutes plus fade. McCartney’s judicious production and music press appearances featuring the pair gave the song further irresistible momentum and it soared to the top of the UK singles charts (only held off top spot in the US by “Hey Jude”). It has since been covered by Sandie Shaw, Bing Crosby, Dolly Parton and Shaggy, making the original writers Boris Fomin and Gene Raskin wealthy men. McCartney was happy enough too since he’d bought the publishing rights. Hopkin's follow-up, a song credited to John Lennon and Paul McCartney but all Paul’s work, was “Goodbye”, a typically sweet slice of whimsy with a sterling melody that made #2 in the UK and was only held off by The Beatles’ “Get Back”. Although Mary preferred her debut, the Ukrainian tune having a timeless appeal, she was ideally suited to capture the poignant pop mood of “Goodbye” and the lovely flip side “Sparrow” written for her by the talented songwriting duo Benny Gallagher and Graham Lyle, also signed to Apple on an in-house basis. Once again McCartney was savvy and they made foreign language versions during which time she first met Tony Visconti who was employed as a technician. Still working with Paul, Hopkin’s third single, “Que Sera, Sera” didn’t fare quite as well but her debut album for Apple, Post Card made #3 in the UK and sold well in Europe and America. The disc is notable for McCartney’s emergent production skills and could be seen as a dry run for his own solo work. Donovan was also integral to the album, providing three songs. The esoteric track listing also includes British band leader Ray Noble’s “Love Is the Sweetest Thing”, something that McCartney would have heard his father sing after the manner of Al Bowlly. McCartney also asked his new friend Harry Nilsson to contribute a tune and he came up with the delightful “The Puppy Song”. Frank Loesser’s “Inchworm” (as sung by Danny Kaye), a brace of George Gershwin and Irving Berlin standards and George Martin’s “The Game” round out the original. In 2010 the Remastered Bonus tracks set included the first two singles (and their B-sides), plus the previously unreleased “Fields of St. Etienne” and digital downloads of the Euro-debut. Earth Song/Ocean Song was produced and arranged by Visconti with cast and crew including Dave Cousins of The Strawbs, bass legend Danny Thompson, The Pop Arts String Quartet (they would soon grace Nilsson’s albums) and Bowie’s engineer/future producer Ken Scott. 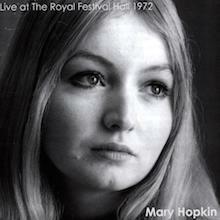 While she would soon depart from Apple Hopkin was captured recorded performing live in 1972 at the Royal Festival Hall. She has since issued this excellent concert on her own Mary Hopkin Music imprint, also the fine Recollections (2008) where she offers covers of songs by Paxton, Jim Croce, Clive Palmer, Paul Williams and others. The compilations The Best of Mary Hopkin and Those Were the Days were both issued in 1972 and here you will find the pre-Hot Chocolate tracks “Think About Your Children”, written by Errol Brown and Tony Wilson, and produced by Mickie Most, as well as the overlooked classic “Water, Paper & Clay”, written by Reina and Mike Sutcliffe. 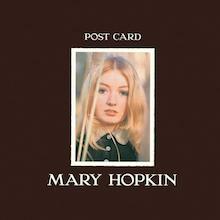 Very much active today Mary Hopkin collaborates with her daughter Jessica and her son Morgan Visconti. She has released albums in recent years including Painting By Numbers (she’s also a gifted artist) and You Look Familiar. Her long time fans maintain her presence all across social media while her songs tell a tale from a more innocent time when Apple was at its crispest. It's hard to know where to begin a review of one's all time favorite album. Maybe that's the best way to begin, actually. I probably own around 2,000 albums, featuring most genres and fairly evenly spread from the 1940s to today in terms of when they were recorded. And "Earth Song/Ocean Song" is #1 among them all. That should tell you something, but maybe not enough to decide on buying it for yourself. So let me tell you a bit more about why I love it so much. First of all, Mary Hopkin had (and no doubt still has) a terrific voice, and she put it to great use here. That sugar-sweet sadness you hear on "Those Were The Days" is more restrained and mature here, with a breathier quality when it suits the song. She also sounds much closer up and never drowned out by the music. And speaking of the music, it's mellow but lush throughout, intense but never too hard. Themes range from breakups to homelessness to plain old self-awareness, but all the songs seem woven together flawlessly into a cycle that somehow makes perfect sense. The album's centerpieces are its two title songs, written by Liz Thorsen. Maybe they're both about finding inner peace (that's the interpretation I've always stuck with), maybe they're about drug-addiction, or maybe they really are only about climbing a crystal mountain and finding a ride to the end of the ocean. However you choose to hear them, they're both wonderfully evocative and relaxing to hear, and as fresh on the 500th listen as on the first. Other standouts include "Silver Birch and Weeping Willow," about finding comfort in your own company when you can't count on others (or is it really just about watching a sunset? You decide! ); "There's Got to Be More," about ending a stagnant relationship; "Streets of London," a not-at-all-preachy look at homelessness; and "Water, Paper and Clay," a classic folk-singalong whose meaning is anyone's guess. That said, there isn't a single wasted note on the album, and you could call them all standouts. I could go on for pages, but suffice to say: if you like folk music, folk-rock, singer-songwriters, or any genre that sticks to real instruments and meaningful lyrics, you can't miss with this CD. Buy a copy for a friend, too. Paul McCartney produced this debut album of twee but pretty, romantic pop-folk. Besides "Those Were the Days" (which actually originally appeared only on the US version, though it's on the CD reissue now available throughout the world), the highlights are Donovan's "Lord of the Reedy River" and "The Honeymoon Song," which McCartney himself had sung with the Beatles way back in 1963 on the BBC. If there's a fault to be found, it's that there's too high a percentage of pre-rock/pop standards à la "There's No Business Like Show Business." As it turns out this was more due to the leanings of McCartney than Hopkin, who preferred the more simply arranged folk numbers such as the Donovan covers and the Welsh "Y Blodyn Gwyn." Also on board is a rather nice composition, "The Game," by Beatles producer George Martin, who contributed some piano and orchestra conducting to the album. The CD reissue includes George Gershwin/Ira Gershwin's "Someone to Watch Over Me" (which was on the original U.K. version of the LP, but was taken off the American counterpart), as well as the "Those Were the Days" B-side "Turn! Turn! Turn!" and versions of "Those Were the Days" that Hopkin sang in Italian and Spanish. "You might describe this as a 'farewell' concert, since it marked my determination to give up the 'music biz' into which I had been thrust barely three years before." Mary Hopkin's liner notes of this 34 year old album give an indication as to her attitude to her brief but bright music career all that time ago. Picked up by the Beatles' own Apple label, and thrust into pop-stardom with a trans-Atlantic number-one single, it was only a matter of time before she withdrew. 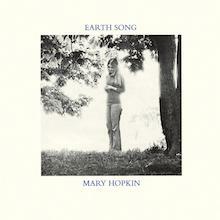 Despite being a few years into her career by 1972, Hopkin sounds shy, self-effacing and modest. She appears with her friends and her husband, producer Tony Visconti, creating the sound and atmosphere of a small fireside get-together. She sounds almost apologetic when introducing her band, as if it was a bit too 'rock star' to do so. The crowd applaud politely, even to the biggest songs here (Those Were The Days, Streets Of London, Donna Donna) and it's a window into an era when whistles and cheering just weren't done, y'know. After each sublimely-delivered, note-perfect song, she issues a quiet 'thank you' and moves on. In the pop and folk crossover world of the time, Hopkin was a star - her voice alone was to thank for that. A cover of the Beatles' If I Fell, a duet with Visconti, is as animated as she gets; the rest of the songs are minimally orchestrated with acoustic guitar, double bass and strings. On the production, her voice is right at the front, doing its job: showing off the skills of an artist of tremendous tender soulfulness.